When you’re out and about you don’t want a big heavy digital camera and that’s why JVC have developed a brilliant, compact digital video camera, the G R D Seventy. The JVC Compact Camcorder is ideal for a big day out, it’s high tech but easy to use and heaps of fun. Along with the JVC Pocket and Advanced range of digital video cameras, the JVC Compact Camcorder makes digital video easier, simpler and smaller giving you the Perfect Experience. It delivers the highest video quality with 520 lines of resolution even though the video camera is ultra light and compact. The JVC Compact Camcorder also takes digital still photos and the built-in flash gives your still shots even better quality. Even in low lighting conditions, the Digital Colour Nightscope lets you keep shooting colour. The JVC Compact Camcorder records excellent audio as well, with PCM Digital Stereo Sound. To maximising your battery time, you can look on the LCD Screen or through the viewfinder and once you turn it on, the Power Linked operation will automatically turn the camera on when you open the screen, and off when you close it. There are all sorts of exciting accessories for the JVC Compact digital video camera. Like a waterproof housing to shoot underwater, what a bright idea and if what you shoot isn’t perfect you can fix it up as all JVC digital video cameras have built in transitions and special effects. 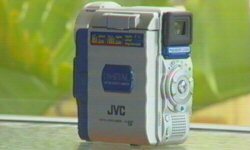 The JVC Compact Camcorder can also update your old VHS footage by recording them to digital tape via an analogue input. Everything with the JVC Compact Camcorder is easy, like transferring your movies and stills from the camera to PC, editing and creating your own Video CDs, even using the camcorder as a webcam, because all the software you need is provided! The JVC Compact digital video camera has a removable Memory Card which makes it easy to store digital stills, print them yourself or take the card into the digital photo lab to get your shots printed professionally! Your digital videos can be sent via email to friends and family all over the world. The JVC Compact Camcorder is a fantastic way to capture incredible memories and is so light, portable and easy to use and if you update to a digital video camera for Christmas you’ll also receive a bonus Carry Bag, Mini Tripod, 3 Digital Video Cassettes and a digital head cleaning cassette! So get into your nearest electronics retailer, log on to the JVC website or give JVC’s friendly customer service a call and find out more about the JVC Compact DVC.